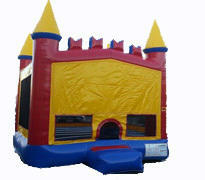 The 4 pillars and brick design of this unique bounce house give it a vivid castle look! This jumper features bright colors that combine well with any party theme, an inflatable ramp at the entrance, and large netted vent windows on the sides to keep things cool for the kids and allow parents to keep an eye on all activities. It also includes a basketball net for extra fun!